Set amongst a working farm, in the beautiful North Cornish countryside and with plenty of space. The glamping cabins/pods have been hand built on the farm and can each sleep up to 4 people (best suited to 2 adults and 2 children). They have all been built with double insulation meaning they stay cool in the summer months, and warm in the cooler months. They feature a family size dining table with seats in the back room which convert to a double bed for the night (king size). The front room has two long benches which become single beds at night. There is plenty of under seat storage plus hooks and lots of shelving. Every cabin has a private deck to the front of the french doors. The cabins are just under 5m in length, 2.4m wide and nearly 3m tall inside, therefore are deceptively spacious whilst remaining cosy. Each cabin has access to their own private shower room with walk-in shower, toilet, sink, mirror and hooks for clothes/towels. The shower room is lockable from the inside and outside. There are two shared kitchens, each with refrigerator, microwave, toaster, kettle, sinks (hot/cold water) and storage. We like to promote a back to nature experience so you won't find electricity in the cabins/pods, however we realise guests like to stay connected at times so we provide free WIFI and there are device charging lockers in each of the kitchens (available to hire for a small fee). The bench cushions easier become mattresses for the evenings. You'll just need to bring your own linen to make it complete (or you can hire linen/bedding from us for a small fee). Higher Culloden Farm is situated close to the North Cornish coast and has four spacious glamping cabins available. The glamping cabins/pods have been hand built on the farm and can each sleep up to 4 people (best suited to 2 adults and 2 children). They have all been built with double insulation meaning they stay cool in the summer months, and warm in the cooler months. They feature a family size dining table with seats in the back room which convert to a double bed for the night (king size). The front room has two long benches which become single beds at night. There is plenty of under seat storage plus hooks and lots of shelving. Every cabin has a private deck to the front of the french doors. The farm is located in the historic town of Camelford and is set amongst the beautiful Cornish countryside whilst being a few minutes walk away from the town. Guests are invited to help with the daily routine to feed the farm animals. Free tea/coffee/hot chocolate and toast is provided for farm helpers afterwards. There is plenty to do on the farm for children and adults. The large play area is very popular with children as is the mud kitchen. An indoor barn provides shelter when needed and you will find the arts/crafts tables here plus the table football/pool table/air hockey games. Occasionally we look for helpers to pick some fruit and veg from the large homegrown veg patch and poly tunnels. The farm has a private stream that runs through the valley and there is a large secluded picnic area available for guests. Spend your evenings cooking by your BBQ or sitting around the large communal fire pit toasting marshmallows and watching the stars. We appreciate that some guests don't always have camping gear, so luckily we have plenty available to hire from our farm shop. For example, guests can hire linen, lanterns, cooking packs etc if required and buy some basic food items too. Wooden construction pods with double insulation, window to the rear and double French doors to the front. Each has a king-sized bed, which folds away to form a dining table and seating during the day, and 2 bench seats, which become single beds. Each cabin has a private shower room with walk-in shower, toilet, sink, mirror and hooks for clothes/towels. There are 2 shared kitchens, each with refrigerator, microwave, toaster, kettle, sinks and storage, plus charging lockers for mobile phones and tablets. Free WiFi. Linen, lanterns, cooking packs and more all available to hire. Private car park. Children's play area, private island with rope swings, a large field for games and a barn for arts and crafts, table football and mini air hockey. Guests are invited to join in with the daily rounds of animal feeding in the morning – chickens, ducks, rabbits and sheep – and there is a large, pick-your-own fruit and vegetable area. Communal campfire. Private stream and picnic area on the farm. 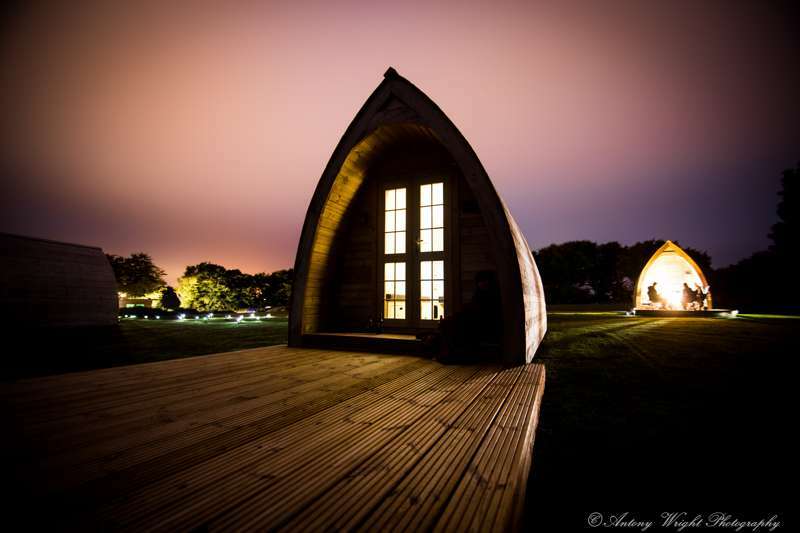 4 glamping pods, each sleeping up to 4 people (2 adults and 2 children). Glamping only. Groups welcome (stag and hen parties by prior arrangement only). No pets. It's a pleasant ½-mile walk into Camelford, which has all the essential shops and things you'll need, plus a large play park for children set alongside the River Camel. The closest beach is Trebarwith Strand (5½ miles; 15-minute drive), which is popular with surfers, while other top spots like Polzeath, Daymer Bay, Widemouth Bay and Summerleaze beach in Bude are all eminently reachable. Spend the day surfing at Polzeath, or take the walk across the coastline to Daymer Bay then Rock, where you can get the short ferry ride over to Padstow for some lunch. Inland, visiting Bodmin Moor is also a must. Higher Culloden Farm just a few miles away from Roughtor, the second largest peak on the Moor and the most exuberant hikers can even walk there directly from the farm. From Roughtor, the largest peak, Brown Willy can be walked to in less than 1 hour too. As the highest point in Cornwall, you get the most stunning views across the moor and beyond. If you like cycling, then you can't glamp in the Camel Valley without pedalling the Camel Trail. Pick up the trail at Bodmin and follow it all the way to Padstow. If you don't have bikes of your own, then there are plenty of hire centres along the way (there are several in Wadebridge). The Wadebridge to Padstow route is the flattest section, making it very popular with families. Higher Culloden Farm is also located in a designated dark skies zone, one of just a few in the UK, so expect excellent stargazing on clear nights. Walk the five minutes into Camelford, where there's plenty of choice. The Masons Arms (01840 213309) and The Darlington Inn (01840 213314) are the best pubs (the former has an extensive menu and excellent food), while award-winning Peckish Fish & Chips (01840 213587) is right at the bottom of the farm lane. There are also other takeaways and restaurants, including Hong Kong Island Chinese takeaway (01840 213848), Curry & Rice restaurant (01840 213050) and Mexi-Kernow (07984 472659), which offers fantastic Mexican food. The Cornish Maids Pasty Shop (01840 212749) is worth popping into for a lunchtime bite and there's a Co-op if you want to grab some groceries for cooking back at Higher Culloden Farm. Higher Culloden Farm is easily accessed from the A39 (the North Atlantic Highway that runs across the north of Cornwall). The A39 runs through Camelford. Look out for College Road, next to the Peckish Fish & Chips shop and the bridge over the river. The farm is at the top of this road (about ¼-mile along) and easy to spot. Buses run to Camelford, with excellent access out to local towns and the larger towns within Cornwall (Bodmin, Wadebridge, Bude and Newquay among them). It's less than a ½-mile walk from the bus stop to Higher Culloden Farm. The nearest train station is in Bodmin (14 miles).